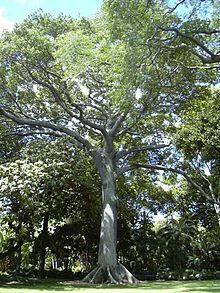 Ceiba pentandra or the Kapok is a species of tropical trees of the order Malvales and the family Malvaceae (previously separated in the family Bombacaceae), native to Mexico, Central America and the Caribbean, northern South America, and (as the variety Ceiba pentandra var. guineensis) to tropical west Africa.The normal colours are white and pink flowers it takes 4 weeks to grow a bud. The word is also used for the fibre obtained from its seed pods. 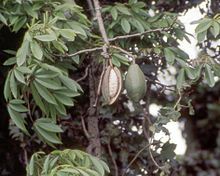 The tree is also known as the Java cotton, Java kapok, or ceiba. It is a sacred symbol in Maya mythology. The tree of life grows to 60–70 m (200–230 ft) tall and has a very substantial trunk up to 3 m (10 ft) in diameter with buttresses. This page was last changed on 7 February 2017, at 16:05.